People with Kinesthetic intelligence learn through movement and experimentation. They enjoy sports and activities that require physical exertion and mastery. Some Kinesthetic people enjoy the artistic side of movement such as dance or any kind of creative movement. These artistic types enjoy acting and performing in front of an audience. People with Kinesthetic intelligence enjoy building things and figuring out how things work. They like to use their hands and are very active. They have excellent motor skills and coordination. They are very physical and are keenly aware of their bodies. Bodily/Kinesthetic is one of several Multiple Intelligences. 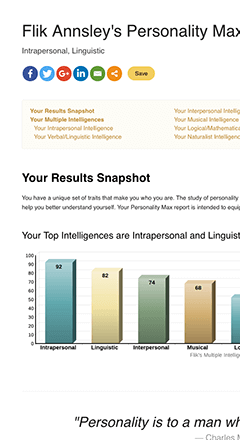 Take the Multiple Intelligences Test, return to the Multiple Intelligences section or read about another intelligence by clicking below. Also see the Kinesthetic Learning Style. Learn your Multiple Intelligences. See your personalized results complete with charts in just a few minutes.